He was born in Green County, Illinois on April 9, 1823, the son of James and Jane Sharp Rawlins. Jane was born in Indiana and moved to Green County, Illinois, early in life. SOURCE: Pioneers and Prominent Men of Utah, film 0025701 p. 160 pict ure, B. 9 Apr 1823 Gree n C0., Ill., Pioneer Oct. 12, 1848, Bishop S0. Cottonwood Ward, R.R. canal constructor, cross ed Plains 7 times. 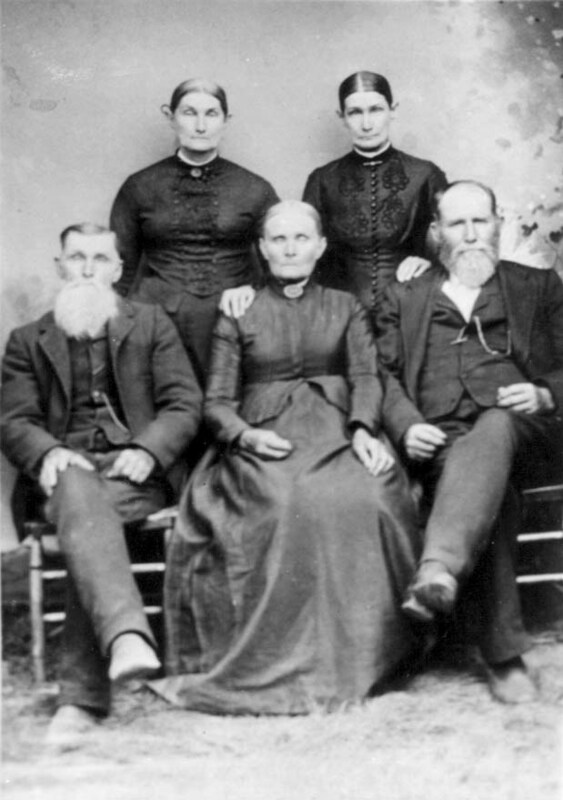 CENSUS: Utah Territorial Census 1851 film 0924039 - age 27; born in I Illinois; Farmer; residence Salt Lake City 0575. WILL: Joseph Sharp was named in Will of father James Rawlins written 4 March 1872; probated 2 0 Feb 1875 in Salt Lake County, Utah. SOURCE: Sketch of Jane Sharp Rawlins, by Ina Danielsen Burton Arrived with family in the Salt Lake Valley 19 Oct. 1848. CENSUS: 1850 census Great Salt Lake, Utah territory, film 025540, pg. 80 families of James Rollins/Jane, next door Joseph S. Rollins/Mary; families Harvey M. Rawlins/Margaret. [S40] Family Records: Rawlins, Lyle, Lyle Rawlins, Hand written notes on Lyle's FG for James Rawlins: #4 Lic 29 Jan 1844(?) by #800. [S77] Family Records: Rawlins, Velma, FG Sheet for Joseph Sharp Rawlins. Source -- Logan Temple Records. Also From Coral Cliffor. [S216] Census Records, Utah 1850 Census Index BYU Library, p. 126 #929.2, 1393. [S28] International Genealogical Index (R), The Church of Jesus Christ of Latter-day Saints, (Copyright (c) 1980, 1997, data as of February 1997), Refs M183394, M183395, 8810632-14 all relate to marriage info..
[S65] James Rawlins Life Sketch, Ina Danielson Burton, (Sketch written and read in Camp Womanho, 13 May 1966 by Daughter Ina Danielsen Burton, grea t great grandaughter. ), 4. Joseph Sharpb. 9 Apr 1823married Mary Ellen Frost. [S52] Utah Burials Database, Utah State Historical Society, (Internet web site), http://utstcess.dced.state.ut.us/NEWBURIALS/Silver., http://utstcess.dced.state.ut.us/NEWBURIALS/SilverStream/Pages/pgLongOne.html?CEMETERY_ID=SL3, 800&BURIAL_ID=1149, Rawlins, Joseph, Gender: Male, Birth: 0/0/1823, Death: 0/0/1900, Buried: 10/13/1900, Grave Location: Murray City Cemetery 02 079 0, Source: Sexton Records / Grant. [S232] Obit Index, Deseret News, (25 Jan 1916). [S233] Obit. Index P. 929, Pt. 173, Deseret News, Rawlins, Joseph Sharp, d. 13 Oct 1900; Deseret News 13 Oct/1900: 1, 4. [S222] International Genealogical index, The Church of Jesus Christ of Latter-day Saints, Record submitted after 1991 by a member of the LDS Church., Search performed using PAF Insight on 22 Mar 2006, Nancy Jane FROST; Female; Birth: About 1827 Of, , Greene, Illinois; Spouse: Joseph SHARP RAWL, INS; Marriage: About 1848 Of, , Greene, Illinois.